Rowan Atkinson was born in Newcastle upon Tyne in 1955. He attended Newcastle University before going to Oxford in 1975, and it was at Oxford that he met screenwriter Richard Curtis, with whom he wrote and performed comedy revues at the Oxford Playhouse and later at the Edinburgh Fringe. After an acclaimed revue at the Hampstead Theater in 1978, Atkinson was offered starring roles in two British television series, but chose instead to join the BBC's legendary "Not The Nine O'Clock News" team, where he first performed with Tall Guy director Mel Smith. After an acclaimed revue at the Hampstead Theater in 1978, Atkinson was offered starring roles in two British television series, but chose instead to join the BBC's legendary "Not The Nine O'Clock News" team, where he first performed with Tall Guy director Mel Smith. The show recorded hugely successful albums, released several best-selling books, won an International Emmy Award, and the British Academy Award for "Best Light Entertainment Program of 1980." For his performance in "Not the Nine O'Clock News," Atkinson personally won the "British Academy Award" and was named "BBC Personality of the Year." His show at London's Globe Theater was sold-out for its entire run, and he won the Society of West End Theaters award for "Comedy Performance of the Year." In 1983, he began working with The Tall Guy screenwriter Richard Curtis on their 'situation tragedy' - Black Adder - for BBC Television. After touring the world with his own show and appearing in The Nerd in London's West End, Atkinson co-wrote and starred in two new seasons of the innovative series Black Adder. While filming The Tall Guy during the day, Atkinson could be found in the theater in the evenings starring in The Sneeze, a collection of Checkov adaptations. Atkinson played a British consul opposite Sean Connery in the James Bond film Never Say Never Again, and in 1989 co-starred with Steven Wright in the Academy Award-winning short film The Appointments of Dennis Jennings. He was most recently seen in Nocholas Roeg's The Witches alongside Angelica Huston, in which he was once again cast as a villian. After finishing the long run of Black Adder, Rowan starred as an officer of the law in the series The Thin Blue Line. 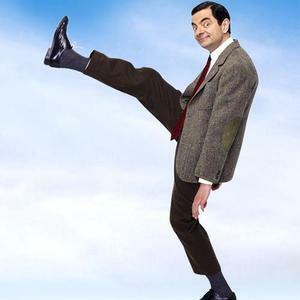 In 1996-1997, he starred in the hit movie Bean.